Philomena went back to her room, where her maidservant was waiting for her. "I heard that you had been summoned by his majesty," said the girl. 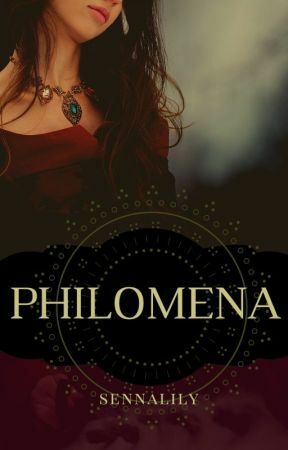 "Everyone has," replied Philomena. "The whole family as well." "I have laid out your best dress," said the maid. She gestured towards the bed, where the kirtle and gown were laid out. The blue velvet was shot with silver embroidery, in geometric patterns around the hemline. Philomena nodded. "You had better braid back my hair as well." The maid helped Philomena remove the simple woollen gown she had worn for the morning, and folded it for storage while Philomena dabbed her face and neck with scented water and removed her shift, then helped her into the new gown. Philomena inhaled deeply, feeling the tight lacing of the dress around her ribcage. She ran her hand over the soft velvet. Lord Valentin had sent her this fabric on her sixteenth birthday. Soon she would need to have the seamstresses put side panels into it, or it would no longer fit her. Tilda began to work her fingers through Philomena&apos;s hair. "My lady, you&apos;ve made some tangles here." "I was in the garden," said Philomena, wincing. "I am sorry." "You shouldn&apos;t apologise to me, my lady," said Tilda, picking up a comb. 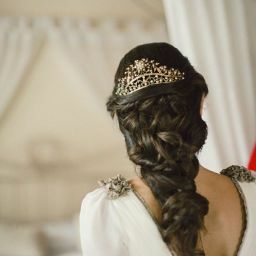 She started at the ends of Philomena&apos;s hair, near the small of her back and worked the tangles out of the heavy black curls while Philomena drifted with her thoughts. "You&apos;re all finished, my lady." Tilda&apos;s words startled Philomena to attention. She turned to the beaten silver mirror and examined herself. At Philomena&apos;s nod, Tilda held up a string of pearls. Another gift from Lord Valentin. Once she had slipped the heavy signet of the Sylvana family onto her left middle finger, she felt ready. The great hall was at the heart of the castle keep. It was a long room with uneven black and white diamond tiles, severe tapestries woven in the Merot style, and a high, wood-beamed roof. At one end was a cloth of gold canopy, under which sat two thrones, currently empty. Crown Prince Tancred and Prince Maldwyn were already present, the former examining the detail of a tapestry hunting scene he must have seen a thousand times before, and the latter lounging against one of the carved wood pillars supporting the canopy. Maldwyn’s wife, Princess Idella, sat near the dais, her gaze fixed on her husband. "My sweet Mena,” said Maldwyn, pushing away from the column and coming towards her. Philomena gritted her teeth and turned around. "Prince Maldwyn," she said. "I give you good den." He tried to take her hand, but she forestalled him by tucking both into the folds of her skirt. Maldwyn assumed a comic pout. “Cross with me, sweet Mena?” Philomena glanced uncomfortably at Idella, who was now watching them both. “Leave Lady Philomena alone, cousin,” said Tancred, not taking his attention from the tapestry. Maldwyn’s expression shuttered for a moment before the mask was back in place. “Of course, your grace, my apologies, your grace,” he said with exaggerated courtesy. According to Deusetatsi law, Tancred, the son of Godfrey&apos;s sister-heir, was Crown Prince and king-in-waiting, not Maldwyn, the king&apos;s eldest son. The room always cooled by a few degrees when they were both in it. Tancred gave no sign of having heard him, and Maldwyn’s expression darkened further.